‍• The offer is aimed exclusively at entrepreneurs (§ 14 BGB) as well as legal entities under public law and special funds under public law, but not at consumers (§ 13 BGB). ‍• The use of all mailflatrate.com services is exclusively governed by these General Terms and Conditions. Other and deviating contractual conditions of the customer are not applicable. Thus mailflatrate.com contradicts these hereby expressly. The general terms and conditions listed here also apply to all future legal transactions. This does not require an explicit renewed agreement. Should the user/customer be against the validity of the general terms and conditions listed here, the user/customer must notify mailflatrate.com in writing beforehand. ‍• Users” are addressees of the offer within the meaning of point 1 paragraph 2 of these General Terms and Conditions who access the services of mailflatrate.com; users can be those who try out mailflatrate.com free of charge, but also those who have already concluded a purchase contract with mailflatrate.com and in this sense are not only users but also customers. ‍• Customers” are users who have registered with mailflatrate.com and can thus use the entire range of services offered by mailflatrate.com; in the General Terms and Conditions listed here, they are described as users for the sake of simplicity when it comes to generally valid points that also include users without a contract. They are called customers when it comes to points for which you have already had to conclude a paid contract. ‍• Mailings” or “campaigns” are the sum of e-mails sent via mailflatrate.com. ‍• After the e-mail address has been entered for the first time and a user name for the login and a password for the registration have been created, the user can test the services of mailflatrate.com free of charge before starting a paid use (hereinafter “test phase”). However, mailflatrate.com is only available to the user to a limited extent at this time. ‍• The registration can be cancelled at any time by pressing the “Back” button and closing the browser window. An overview page appears before the registration is completed. This enables the user to check the correctness of all data entered. If there is an input error, it can be corrected by pressing the “Back” button. The contract language is exclusively German. ‍• Finally, the order is saved by mailflatrate.com and a confirmation e-mail is sent to the user. • To be able to use mailflatrate.com to its full extent, a contract with costs must be concluded. For registration and checkout, a predefined online form is available in which all necessary data must be entered. • Before the account is finally activated, mailflatrate.com checks the user’s details. Mailflatrate.com reserves the right to refuse the activation of an account for the use of mailflatrate.com without giving reasons. • With the activation of the account, the service contract between the parties is effective. However, this does not mean that mailflatrate.com is obliged to perform in person. The customer receives the information about the activation via e-mail. • After a contract has been concluded, mailflatrate.com provides the customer with an account. With a permanent account, the customer now has a multitude of free functions at his disposal, such as uploading or the creation of address lists, as well as the design and preparation of e-mails for dispatch. Communication between the user/customer and mailflatrate.com takes place online via browser, e-mail or telephone. By telephone mailflatrate.com is attainable under 02161 5735502. Services and functionalities provided free of charge by mailflatrate.com are not subject to any warranty. • The dispatch of mailings via mailflatrate.com is a chargeable service. It should therefore be pointed out at this point that mailflatrate.com does not promise or owe its users any particular success in this connection. Nor can mailflatrate.com guarantee that e-mails sent via mailflatrate.com actually reach their recipients. However, mailflatrate.com will take every action to ensure that e-mails are sent by the user to the specified addressees. • mailflatrate.com guarantees an availability of 95% of the mailings in the calendar month. The following times are not taken into account. – 1. mailflatrate.com provides the customer with an account after the conclusion of a contract. With a permanent account, the customer now has a variety of free functions at his disposal, such as uploading or creating address lists, as well as the design and preparation of e-mails for dispatch. Communication between the user/customer and mailflatrate.com takes place online via browser, e-mail or telephone. By telephone mailflatrate.com is attainable under 02161 5735502. Services and functionalities provided free of charge by mailflatrate.com are not subject to any warranty. – 2 The dispatch of mailings via mailflatrate.com is a chargeable service. It should therefore be pointed out at this point that mailflatrate.com does not promise or owe its users any particular success in this connection. Nor can mailflatrate.com guarantee that e-mails sent via mailflatrate.com actually reach their recipients. However, mailflatrate.com will take every action to ensure that e-mails are sent by the user to the specified addressees. • mailflatrate.com guarantees an availability of the mailing of 95% in the calendar month. The following times are not taken into account. – a) Plannable maintenance work that takes place on weekdays between 6 p.m. and midnight and does not exceed a total duration of 12 hours quarterly. These will be communicated to the user 48 hours in advance by e-mail. – b) Unscheduled maintenance work due to hardware failures or force majeure. • mailflatrate.com checks the campaigns on a random basis for breaches of contract or laws. Therefore, mailflatrate.com also reserves the right to keep a copy of each mailing. There is no obligation on the part of mailflatrate.com to review mailings for their content. 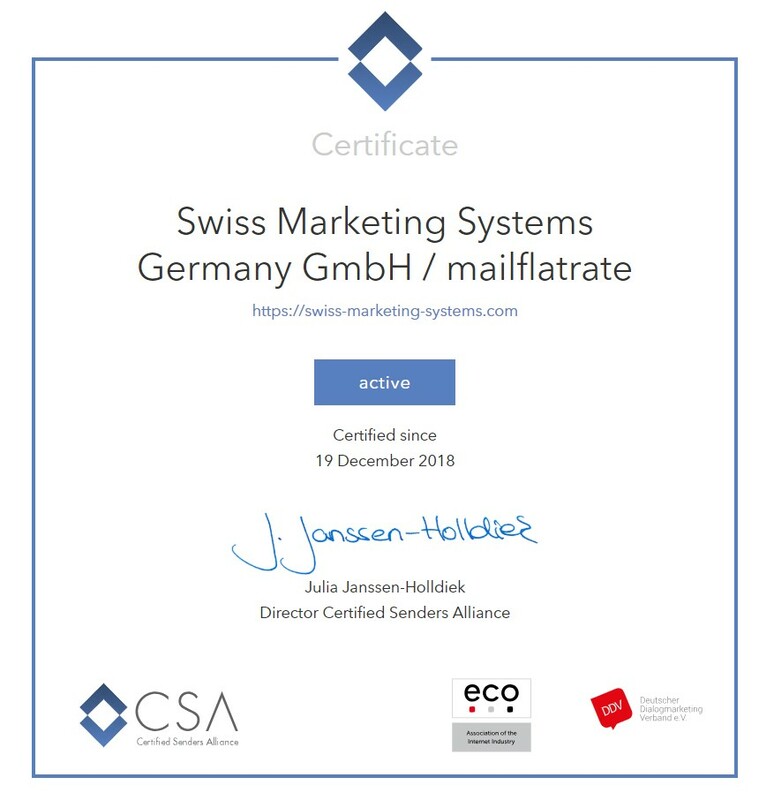 • mailflatrate.com is not subject to the obligation and responsibility to operate the Internet access of the customer and the associated data lines in the public network. An exception applies to the communication between the servers of mailflatrate.com and the public Internet. In the event of power failures over which mailflatrate.com has no control, mailflatrate.com will not assume any responsibility. • All services and functions available to the customer are described in detail on the mailflatrate.com website. Mailflatrate.com reserves the right to make regular updates, improvements and additions to mailflatrate.com as long as they are reasonable for the customer and do not interfere with the mailing. • mailflatrate.com is entitled to have services provided by third parties. ‍• The respective contractually agreed prices shall apply. Prior to the conclusion of the contract, the customer shall be informed of the respective costs incurred. All prices quoted are net prices plus statutory value-added tax. ‍• The amount will be debited monthly or annually depending on the subscription. The invoices can be retrieved from the customer’s account. The customer receives an e-mail as soon as there is a new invoice. ‍• Payment is made via third-party providers such as PayPal and Stripe (credit card payment). – b) Should data change after registration and after conclusion of the contract, the user is obliged to inform mailflatrate.com immediately or to correct this in his account. – c) The user ensures that his user name and password are not made accessible to third parties and that any use of the services of mailflatrate.com under his own account by third parties is prevented. – d) Should it nevertheless happen that the user’s account is misused by third parties, the user must immediately inform mailflatrate.com at support@mailflatrate.com about this. – e) The user may not use mailflatrate.com for illegal or immoral purposes. The rights of third parties must also be respected here. This means that the user ensures that content stored on his account or disseminated from his account does not violate legal provisions for the protection of minors, general personal rights as well as other protective rights such as trademark rights, company rights and copyrights, third party rights. Therefore, the user is required to check every storage and dispatch of his contents (e.g. text, photography, graphics, pictures, videos, music). Particularly with picture material and videos it is necessary that the consent for the spreading of the material of the illustrated persons is present. Contents may not be stored or spread without a consent of the represented persons. – f) A storage and spreading of material with pornographic, immoral, racist, right-wing extremist, defamatory material or material which attacks religious beliefs is strictly forbidden. – g) The user also undertakes to send the mailings to recipients from whom he has the express double consent to receive (double opt-in). The user must be clearly identifiable as the sender of an advertising mailing. In addition, it is indispensable for the user to include a truthful and complete imprint in his mailings within the meaning of §5 paragraph 1 of the German Telemedia Act (TMG). In addition, the user must offer his recipients a free and easily understandable option in his mailings in order to be able to cancel the mailing in the future (opt-out). – h) The user names a contact person with telephone number and e-mail address to mailflatrate.com in case of complaints or disturbances. Upon request, the user must explain to mailflatrate.com in writing how the e-mail addresses were collected. In individual cases, the presentation of declarations of consent by the recipients of the mailings by mailflatrate.com may also be required. – i) The user is required to comply with the legal requirements of data protection and data security, in particular with regard to the provisions on address trading in §§ 28 et seq. of the German Data Protection Act. BDSG as well as §§ 11 ff. TMG. In the case of mailings that are sent abroad, the user shall ensure that the law there is not violated. – j) Should the user violate any of the listed points, mailflatrate.com is entitled to temporarily block and/or delete any affected content with immediate effect and/or temporarily or permanently exclude the user from mailflatrate.com and/or terminate the user without notice. Even without violation, mailflatrate.com is entitled to temporarily or permanently block an account if there are indications for an existing or threatening misuse of the account by third parties. If damage should occur due to a violation by the user, the user must compensate the resulting damage, unless he is not responsible for this. Furthermore, the user is obliged to indemnify mailflatrate.com from all disadvantages that mailflatrate.com may suffer as a result of claims made by third parties due to damaging actions for which the user is responsible. With regard to a violation of the imprint obligation, mailflatrate.com will provide recipients of mailings with the user’s name and address upon request. ‍• Company and logo of the user may be listed in reference lists by mailflatrate.com. In addition, mailflatrate.com is entitled to publish these on the Internet or in print media for factual information. Any other use is not permitted. Both mailflatrate.com and the user may publish press releases with a brief description of the cooperation. ‍• The contents provided on mailflatrate.com are subject to copyright protection. Therefore, the user may not copy these contents beyond the use granted by the right holder in individual cases and it is also forbidden to him to edit or distribute them. ‍• mailflatrate.com does not guarantee the functionality of the provided systems. The user agrees with these general terms and conditions that mailflatrate.com cannot develop a mailing service that is error-free for all application conditions. Furthermore, no guarantee is given for the transmission and/or completeness of the transmission of mailings. ‍• Consequences resulting from content or dispatch are only the responsibility of the user and in no case is mailflatrate.com responsible for consequences. ‍• Liability for slightly negligent breaches of duty on the part of mailflatrate.com is excluded. An exception from this rule concerns damages resulting from injury to life, body, health, guarantees or claims under the ProdHaftG. The liability for breach of duties and conscientious execution of the contractual provision, which are assured to the customer, remains unaffected. This also applies to any employees and partners of mailflatrate.com. ‍• In case of slightly negligent breaches of duty, which are related to contractual provisions, mailflatrate.com does not assume any liability for extraordinary consequential damages. ‍• The service contract is concluded for an indefinite period. In the case of a monthly contract, the contract may be terminated by either party within the month, but no later than 24 hours before the end of the current month. In the case of an annual contract, notice of termination must be given at least one month before the end of the contract period, otherwise the contract will be extended for a further year. ‍• The right to termination for extraordinary reasons remains unaffected. ‍• Cancellations must be made electronically. The legal simplifications to the written form, in particular those according to § 127 BGB, apply. At www.app.mailflatrate.com/customer/account/index customers can terminate their current contract or deactivate their account. ‍• The law of the Federal Republic of Germany shall apply to the exclusion of the UN Convention on Contracts for the International Sale of Goods. ‍• The place of jurisdiction for all disputes arising from and in connection with contracts concluded on the basis of these General Terms and Conditions is Mönchengladbach. For procedural requests and lawsuits on the part of mailflatrate.com against the user, every other place is valid besides Mönchengladbach, where a legal place of jurisdiction of the user exists.